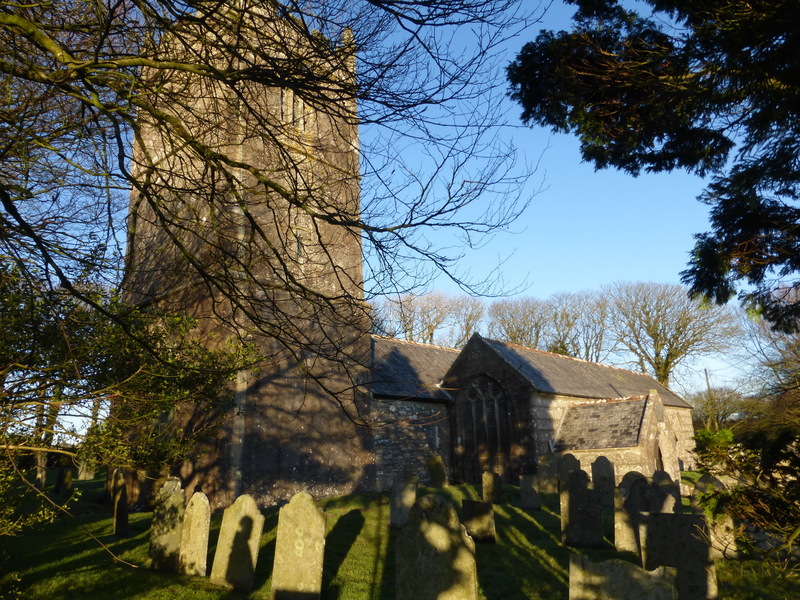 St Brueredus stands high up in its own churchtown at one end of the straggling moorland village of St Breward. It is a fine and solid granite building parts of which may have replaced an earlier Saxon church on the same site. One is greeted by a charming slate sundial over the S porch which declares Seize the moments as they fly. Know to live and learn to die. Despite the shortness of the inscription, the carver had to insert the word fly on the line above. This is a hint at what is to come inside. There is good Norman evidence in the church, despite the re-working by JP St Aubyn in 1863-5. The north aisle arcade consists of stout Norman pillars which are something of a contrast to the tall arches and slender pillars of the C15 S aisle. 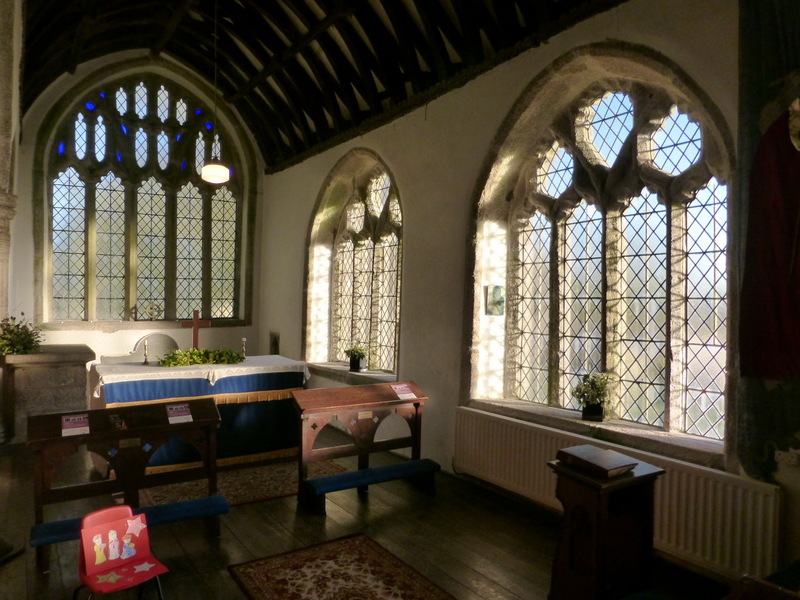 We visited when the winter sun was low in the sky and this lit up the S aisle with its perpendicular windows with low sills, making the whole church seem light and airy. 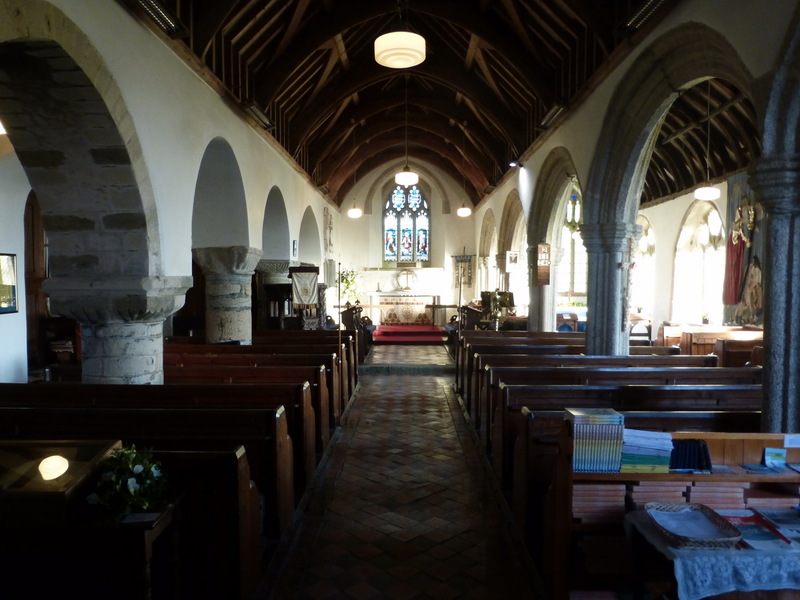 St Aubyn left the wagon roof in the S aisle but replaced the nave ceiling with one of his dull wind-braced roofs. There are some fine monuments in the S aisle and chancel. Two of these, one to Christopher Rogers (d1609) and Lewis Adams (d1607) have unusual kneeling raised figures. 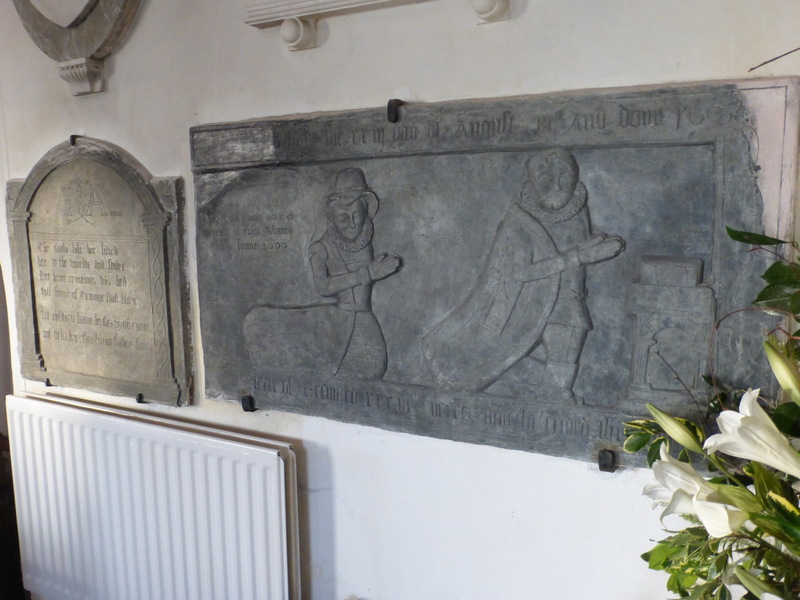 The monument to Nicholas Burrough (d1651) appears to have some vicar-verse but this turns out to be a rendering of Psalm 131 using the word ‘puft’ which the Authoirsed Version renders as ‘haughty’. Is this an early use of the concept of being ‘puffed up’? Another part of his monument appears to be mis-quoting Shakespeare as it says The world is very like a play where every age con[…] his scene and so […] departs … Sadly, the stone is damaged the vital words are missing. This is surely bold stuff for the straight-laced period of the Commonwealth when the theatres were closed. Some original bench-ends have been rescued, rather garishly painted, and used to line the front of the front pews and the parclose screen. The font is made up of chunks of granite in an unusual shape which looks as though it might be upside down. A small picture illustrates a sketch by Rowlandson who visited the local area and obviously became bored during a service, sketching the vicar in full flow. He also seemed to be sitting at the east end of the S aisle when he sketched the scene. Altogether, we enjoyed St Breward which felt spacious and welcoming with none of the playgroup detritus of some in-town churches.